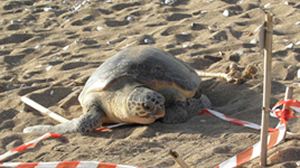 The large stripes of sand-dunes extending from Kalo Nero to the mouth of Neda-Delta are second place after Zakynthos for providing a shelter to the Mediterranean sea-turtle Caretta-Caretta, for its reproduction. The turtle nests made, by giant mothers, deep at the sand, at least 0,40 cm, to be protected from their physical enemies. Nests are spotted, by the tuttle footprints. The little turtles after the successful hathcing of the eggs, by the hot rays of the sun, for about 50 to 60 days, are old enough to make safely their virgin journey to the sea. The inhabitants and visitors of Kalo Nero and Elaia, have been coexisted for centuries, with these creatures, love and protect them. Leaving Kalo Nero you go North along the beach road until you reach Elaia. The village is situated in the heart of a vast olive-tree orchard, by the mouth of Neda, and was once called Bouzi. Elaia is a relatively recent village. The first houses were built around the turn of the century, when the railway rails were being constructed to connect Pyrgos with Κyparissia. 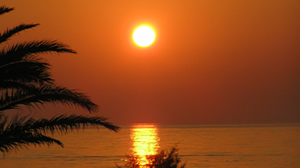 It offers a great view to verdant fields that lead to the pine-wooded beach of the Κyparissia Gulf. The view is even more exciting around dusk, with Strophades islands, Zakynthos, and Cephallonia rising from the Ionian Sea. Α little after Elaia you can turn right ( Eastwards) and take the asphalted road, leading to the verdant land around the river´s waterless banks. The road proceeds through vast cultivated lands of the most fertile kind and the river disappears into numerous furrows of sand and pebbles.